Cornus kousa 'China Girl' is one of the best selections of the Flowering Dogwoods. It is a stunning small tree with dark green oval shape leaves which change colour dramatically during the autumn season. C.kousa is native to Japan and Korea however this selection was first introduced from Holland in the 1970’s. C.kousa 'China Girl' produces a mass of creamy, yellow tinted flowering bracts generally around June. The oval foliage is dark-green, turning fiery shades of orange, red and purple in autumn. Small pink fruits that have a similar appearance to strawberries also adorn the branches in the autumn. These strawberry like fruits are edible although the skin can be tough. The tree also is very good at withstanding winters with temperatures of -15 and below. 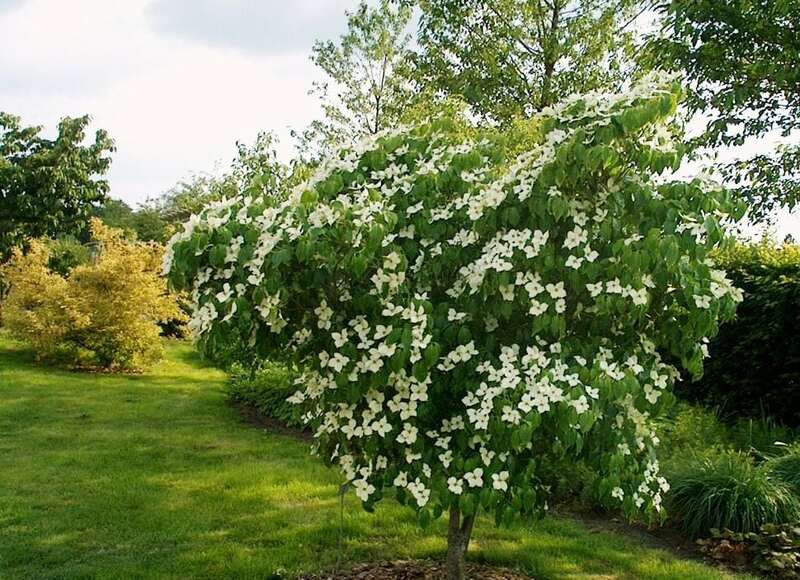 The flowering dogwood prefers to be in a well sheltered area with rich, well-drained soil. Does not thrive on alkaline soil or poor waterlogged soils. Little maintenance is needed for the tree as it naturally grows into an attractive architectural shape. Fully hardy.